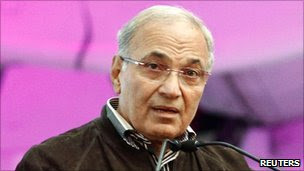 Egypt's Prime Minister Ahmed Shafiq has resigned, the country's ruling military council has announced in a statement on theiy website. Essam Sharaf, a former transport minister who opposed Mr Mubarak's government after stepping down from the cabinet, and supported the revolution has been asked to form a new government, the statement adds. Mr Shafiq was appointed days before President Hosni Mubarak was forced out of office following days of anti-government protests. Protesters saw Mr Shafiq as too closely associated to Mr Mubarak's rule. "The Supreme Council of the Armed Forces decided to accept the resignation of Prime Minister Ahmed Shafiq and appointed Essam Sharaf to form the new government," the army said in a statement on its Facebook page.